The grammatical term "pronominal" means "relating to a pronoun." You already know that conjugated verbs always need a subject pronoun (except in the case of the imperative), but pronominal verbs need a reflexive pronoun as well. Ils se sont mariés. They got married. Je me lève. I’m getting up. Tu t’endors. You’re falling asleep. English doesn’t have pronominal verbs per se. We can translate Je m’habille as "I’m dressing myself," but we’re far more likely to say "I’m getting dressed" – the fact that it’s myself is implicitly understood. This is not the case in French. If you’re dressing yourself, you need the reflexive pronoun, because without it, you’re automatically saying that you’re dressing someone else. Many French verbs can be used reflexively and reciprocally as well as non-pronominally. Nous nous voyons dans la glace. We see ourselves in the mirror. Nous nous voyons tous les jours. We see each other every day. Nous voyons beaucoup de films. We see lots of movies. The infinitive of pronominal verbs is preceded by the impersonal reflexive pronoun se, which must change to agree with the subject of the verb. The verb itself is conjugated as usual according to whether it’s regular, irregular, or stem-changing. The reflexive pronoun has to match the subject in all tenses and moods. Future Je me lèverai. I will get up. Passé composé Je me suis levé. I got up. Infinitive Je vais me lever. I’m going to get up. 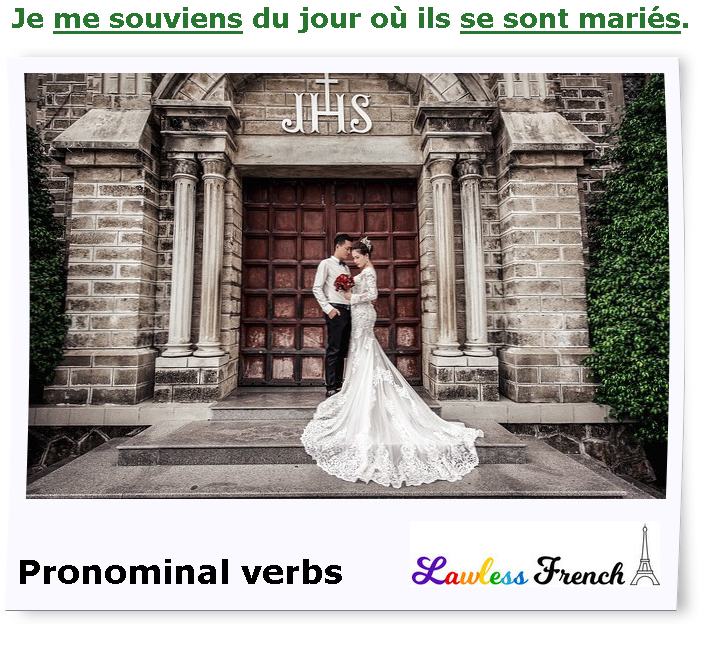 In addition, pronominal verbs usually require agreement in the compound conjugations.